LEEK TOWN were founded in 1946 and were initially known as LEEK LOWE HAMIL. After playing in various local leagues they became founder members of the North West Counties League in 1982. 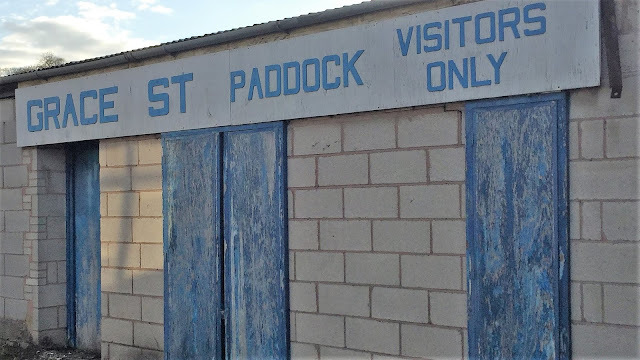 After a number of mid table finishes they joined the Northern Premier League in 1987 and after two 3rd place finishes in their first 2 seasons, they won Division 1 in 1990 and were promoted to the Premier Division. They were generally successful at this level and despite finishing in 2nd place in 1994, they missed out on promotion to the Conference due to financial irregularities. Their pain was compounded by the bizarre decision to place them in the Southern League for the following season, though they returned straight to the Southern League, winning it outright in 1997. 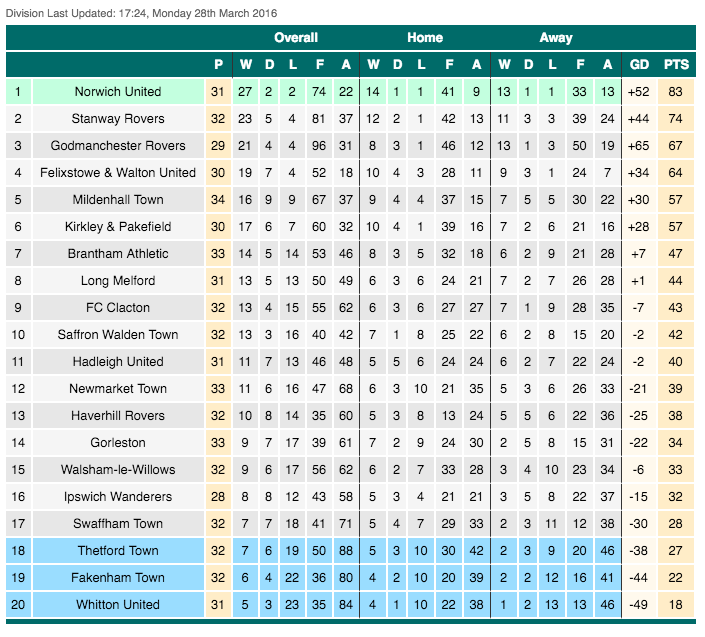 This time everything was in order for promotion to the Conference and 1997/98 saw their highest ever placing as they finished in 19th place in Non League's top tier. It didn't last however and the following season they were relegated back to the Northern Premier League. Another relegation was endured in 2001 as they returned to the NPL Division 1. They spent 2004-2008 in the NPL Premier after earning promotion back, even finishing 7th in 2004/05. 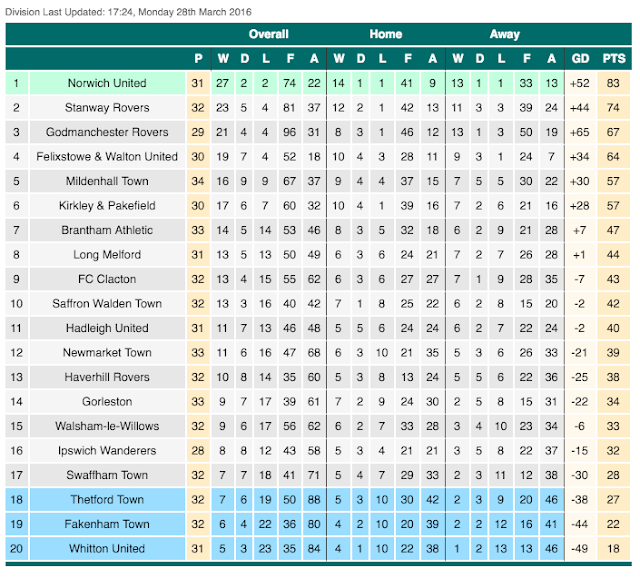 However another relegation followed and as of the 2008/09 season they have been in the NPL D1 South. 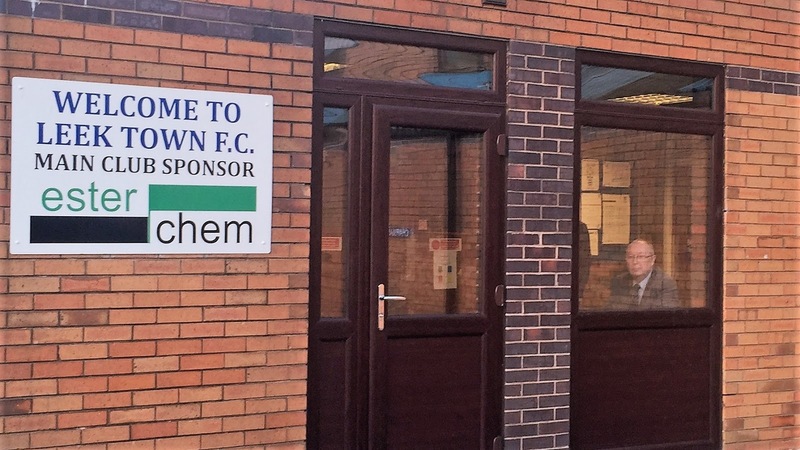 They've come close to returning in the last 2 season, but have lost in the playoffs to Belper Town and Sutton Coldfield Town. Prior to tonight's game, they sat in 7th place, just outside the playoffs and needed to be bang on form if they fancied another crack at the end of this season. In the FA Cup the club reached the 2nd Round in 1990/91. With a bye to the 1st Round they beat Scarborough before losing in a replay to Chester City in Round 2. They reached the FA Trophy final in 1990 beating Conference sides Telford United, Darlington & Stafford Rangers before losing 3-0 to Barrow in the final at Wembley Stadium. 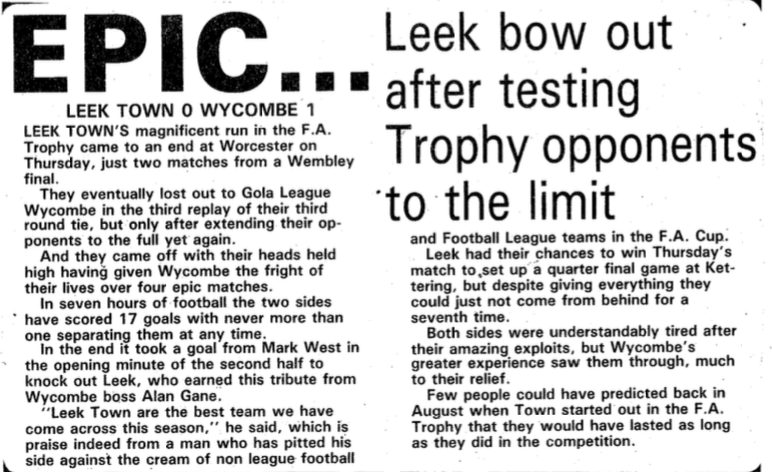 However the FA Trophy duel that intrigued me was the duel between Leek Town & my team Wycombe Wanderers that occurred during the 1985/86 season. I was still 6 years away from being a Wycombe fan and although I've only seen the results in old programmes, I decided to investigate further. Wycombe had beaten Crawley Town & Barnet in the first 2 'proper' rounds to get this far. Leek Town had a much tougher task, staring back in the Preliminary Round back at the start of the season. 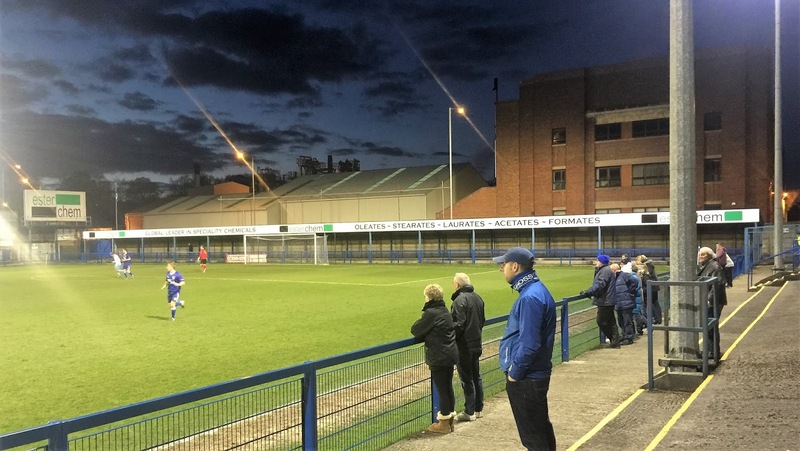 They had overcome Spalding United, Sutton Coldfield Town, Buxton, Dudley Town, Rhyl and Macclesfield Town to get this far. With the third round draw Conference side Wycombe Wanderers would be firm favourites against their opponents, especially with home advantage against North West Counties League side Leek Town, who plied their trade a few levels lower. There had already been drama before the game had even kicked off. The Wycombe manager Alan Gane had a wasted journey when scouting Leek as the game was postponed and the same inclement weather had thwarted Wycombe's attempt to get the game on the Saturday that it was supposed to have been played due to heavy snowfall. Trying again the next Tuesday, a local referee passed the Loakes Park pitch fit on the morning of the game meaning that the giant killers from Staffordshire faced a long trip south for the game. 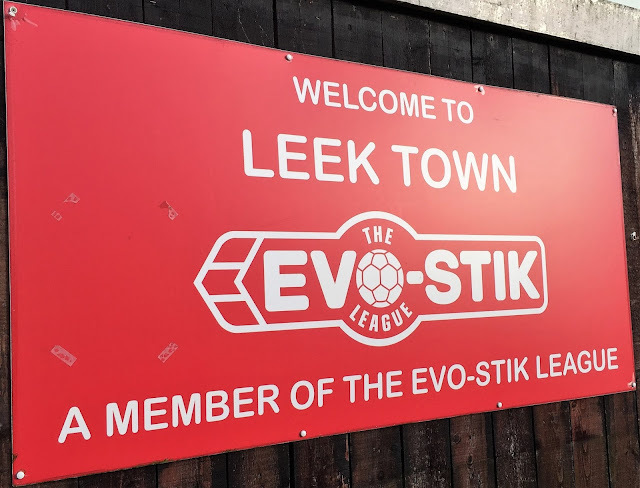 On a treacherous surface the visitors had much the better of the 2-2 draw and Wycombe could count themselves lucky to get a replay as they drew 2-2 to set up a replay at Leek's Hamil Park stadium. An incredible 5-5 draw (match reports from the Chairboys Archive website) was played out. Though the game went into extra time there were no penalties in those days and so the game went to a replay at Worcester City. Still the sides could not be separated as they drew 1-1 and so the sides travelled again to Worcester the following week. Finally after over 8 hours of football and a tie that had taken 4 games and nearly 6 weeks to complete was decided when Wycombe's local hero Mark West netted the only goal of the game in front of 890 fans to hand Wycombe a quarter-final tie at Kettering Town. 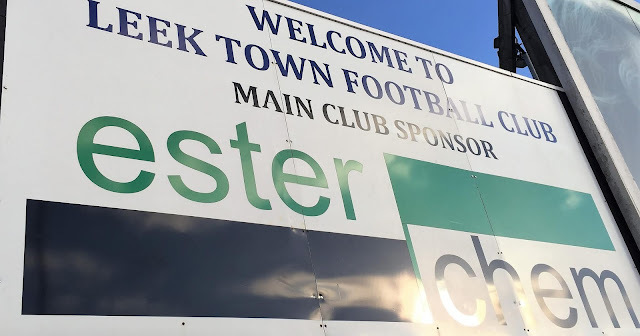 A tired Wycombe side who had played 7 games in 14 days as well as having day jobs bowed out 2-1 against their league rivals to end their best progress in the competition for 4 seasons, however the real story of the run was Leek's brave resistance and cup heroics. 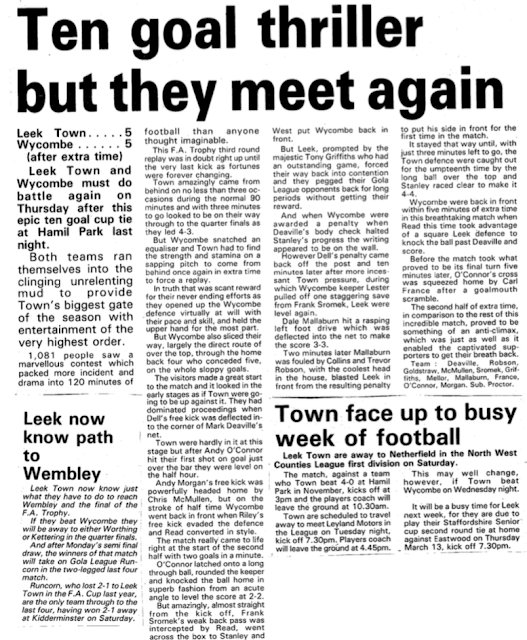 Leek Town were a team that Anwar and I had wanted to visit for ages but one way or another it had passed us by. It was certainly one of the better grounds in non league with plenty to photograph - indeed I had already been there on the way back from Macclesfield one year - though I had to go up a nearby street to get some pictures as it was all locked up and there was only a grumpy sod at the ground who was not very welcoming and asked why I was taking pictures. I was pleased when this game against Lincoln United came up, especially as it looked a close-fought clash with the 2 sides both going for the playoffs. Leek had won 1-0 against Rugby Town on the Saturday in manager Anthony Danylyk's first game in charge, whilst visitors Lincoln United had lost 2-1 to struggling Loughborough Dynamo. I'd seen the hosts twice before - in November 2013 they were thumped 5-0 as they fielded a much-changed line up at Nantwich in a Doodson Cup tie, then last November they squeezed past Midland League side Rocester in a FA Cup replay. 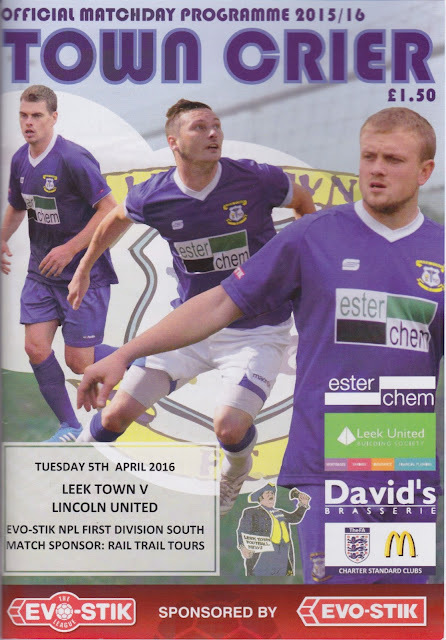 I'd also seen Lincoln United in a pre-season game against local rivals Lincoln City. Had I not been so keen to get to Leek, I’d probably have headed to Northampton Spencer. The club were folding at the end of the season according to strong rumours and so I was running out of time to tick the ground. I’ll have to cross my fingers that a game there that I can attend will come up, but with all my research on my blog done for Leek and arrangements made with others to give lifts, I wasn’t going to make a last minute change. On the day of the game, I walked down town as per usual, getting my hair cut as it was becoming a bit of a mess. I tried to plan a few more groundhops without success as people were busy on the dates that were selected. There was also bad news about my favourite pub near Portsmouth’s ground ‘The Old House At Home’ in that it had closed down as the landlord had gone bankrupt. 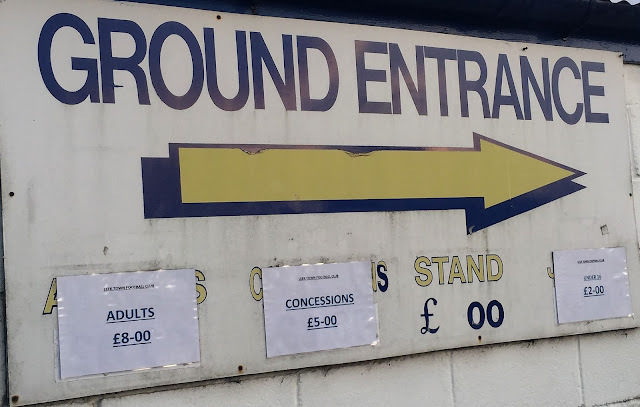 Initially, I thought that I was going to skip Portsmouth v Wycombe, but with plenty of other good places around the ground, and nothing that jumped out as an alternative, I may still stick to my original plan. That said it’s tempting to do Northampton Spencer that day, even though it’s only their reserves, just to get it done before it goes. I left home at 2.30, meeting Anwar in Aylesbury at 3 as arranged. The journey up there was a pain, slow getting out of Aylesbury, then 6 cars decided to smash into each other almost as soon as we got on the M1. That led to the police closing 2 lanes and over an hours delay with us not getting to the ground until nearly 6.30. Thankfully it looked as if everyone was OK with just a few crumpled bumpers but it was a pain in the backside all the same. This was a lot later than I'd hoped but even so we still went down Wetherspoons. I had a Tennesee burger meal deal with lemonade and my favourite Black Dragon cider on the side. 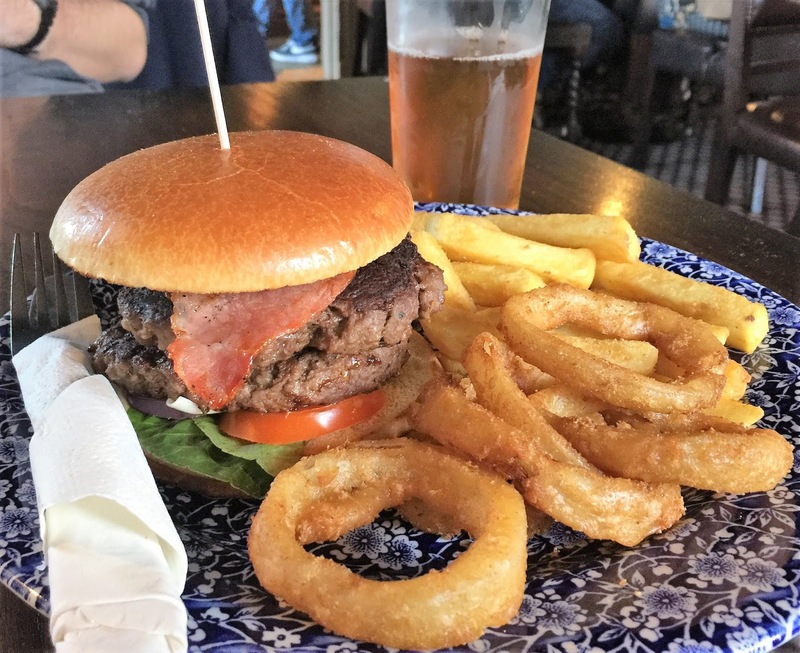 The burger was cracking and probably the best of the Wetherspoons gourmet range with a great Jack Daniels sauce. From there we walked back to the ground, paying £8 to get in, plus £1.50 for a programme. I walked round the ground and chatted to some friendly Leek fans who had seen my blog and knew I was coming. They certainly went for quality over quantity. A good vocal support with lots of colour and flags but you have to wonder why the people of Leek don't support their team more. It's a fine town with a decent population but there was barely 200 there on the night. 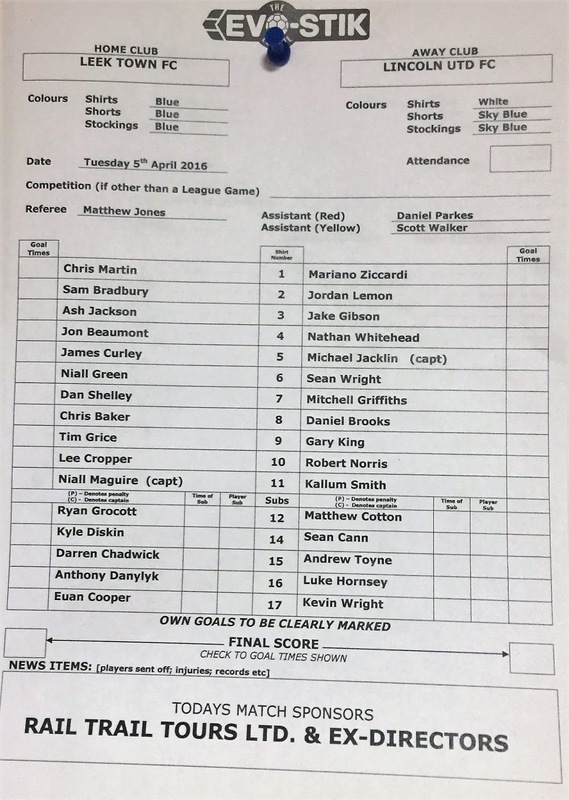 The hosts took the lead 10 minutes in after a Lincoln United defender handballed on the line. 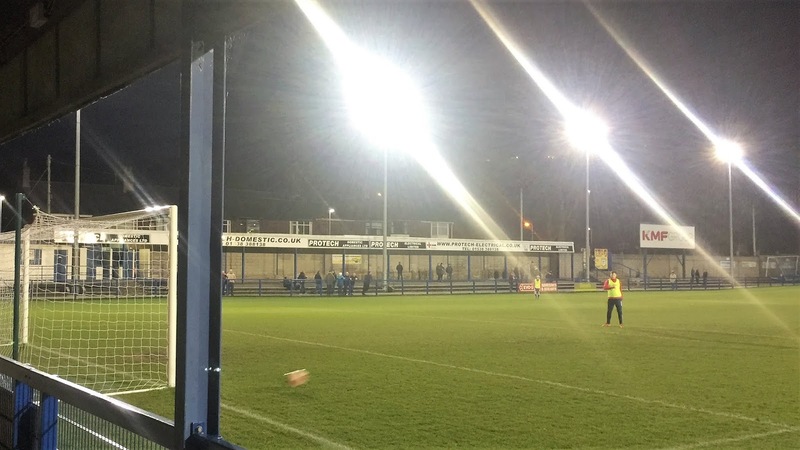 He was sent off and Lee 'Roy' Cropper dispatched the penalty to give Leek the lead. Just before half time, the visitors equalised. A well-worked move resulted in a close-range finish by Mitchell Griffiths. It was pretty equal in the second half but right on full-time Matthew 'Dot' Cotton scored what looked like a winner with an excellent finish into the bottom right-hand corner. 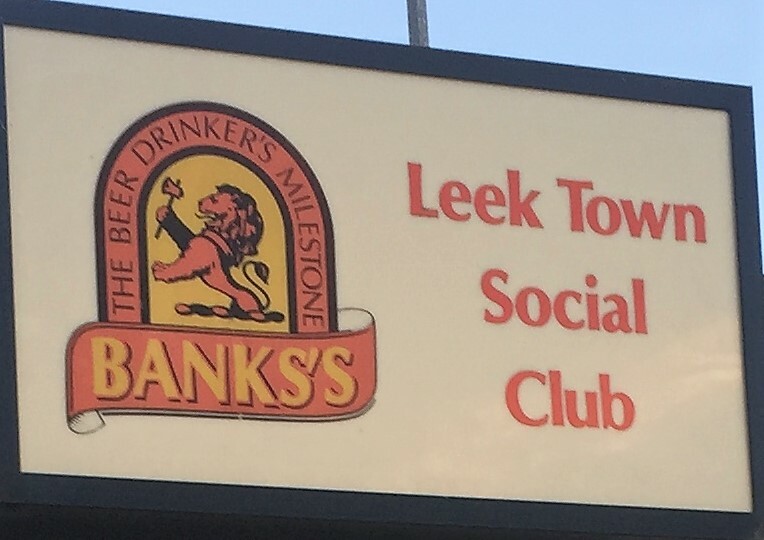 It had been a decent contest at a smashing venue, but I think Leek will be disappointed at not taking advantage of the extra man. The journey back was good, with just the occasional slow driver on single carriageways. I dropped Anwar off at 12.15, getting home myself 20 minutes later and going to sleep around 1.30 am. HARRISON PARK is a cracking ground for step 4 football and shows that it has been in the Conference. There is cover on all 4 sides with a seated capacity of over 500 and an overall capacity of 3600. The tea bar looked decent, though I'd already eaten so didn't try anything. 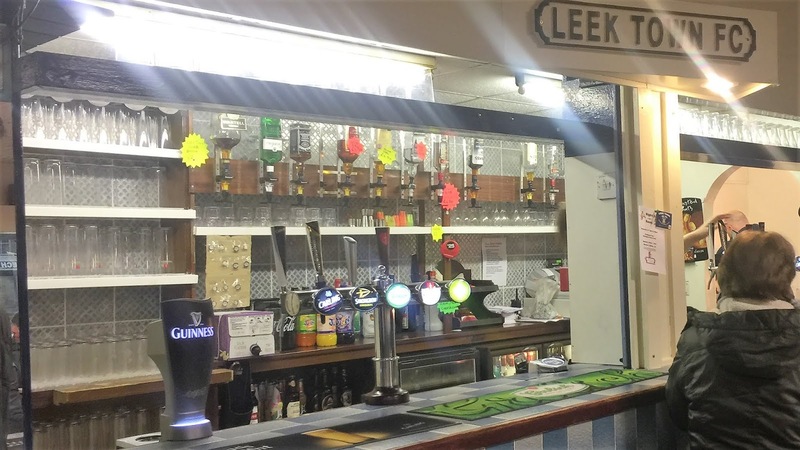 The clubhouse was nicely furnished with the standard range of drinks and had a small selection of merchandise on sale. 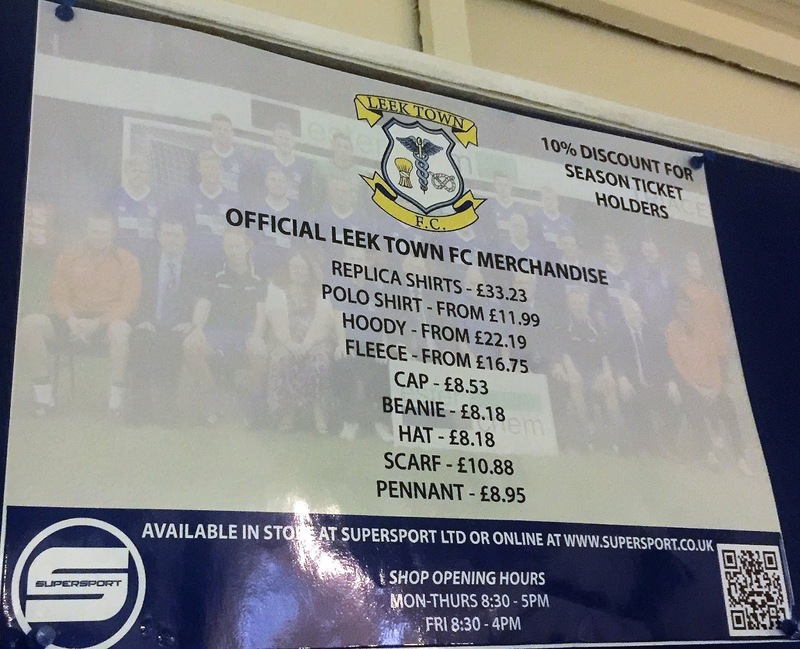 I didn't see a club shop on my visit, but it's supposed to have old programmes for sale. The town is just under a mile away and has a number of decent pubs including a good Wetherspoons called The Green Dragon. There is also the usual plethora of takeaways and food shops as well as some outlets nearer the ground if you are pushed for time. One nice regional delicacy are oatcakes which are like pancakes except made of bread and are savoury, filled with stuff like egg and bacon. Sadly I was pushed for time so I can't say where to get them.